Music synthesizers are back in the news, and that's great news for aficionados of the genre. But what about us poor schlubs who are unable or unwilling to fathom the nuances of this electroacoustically artsy style? What, exactly, is a music synthesizer? For an explanation, we turn to the American Linguistical Remediation Dictionary. Synthesizer: one that combines or synthesizes to the extent of promoting synthesis, often with a keyboard. See also synthesis, synergy, Synklavier, synagogue and Beano Bengaze. Synthesis: a synthetic prosthesis, such as a titanium nose. Etymology: In the Middle Ages, noses belonging to members of certain avant-garde religious sects were removed at birth and placed nostril-up in fertilizer-filled sarcophagi in the belief they would be visited by archangels taking the corporeal form of tweezers bearing good luck and chocolates. The attendant physicians, typically unschooled in state of the art cosmetic surgery practices of the day, replaced the noses with artifices made of reinforced cardboard. While functional and, for a while, even stylish, the life spans of these pseudoschnozzles were severely abridged if the wearer experienced prolonged bouts of sneezing, which the appendages often provoked. Temporary wooden noses became fashionable after Martha Washington opted for one to cover a melanoma the size of an artichoke on her own honker. Today, most false noses are made of an amalgam of latex, leather and linoleum by a guild of artisans in Tuktoyatuk. See also tungsten lips. Tungsten lips: an aftermarket, corrosion-resistant labial gateway that surrounds the opening of a mouth or other telepathic orifice. Invented by Beano Bengaze, a nasally-challenged musical shaman, they enjoyed an haute couture popularity in Paris during the 1920s. A design flaw that limited facial expressions to grimaces and contributed to an increase in cases of voluntary anorexia eventually led to its demise. See also synthesizer. Yes, well we've already been there, done that. So, free associating this and other related definitions, a music synthesizer is an electrical tool that a composer can employ to produce novel sounds that would be much more difficult to produce through standard instrumental means, what with prima donna musicians unwilling to play any tune that might distend their lip cartilage and ready to sue a composer for writing a passage that caused his or her lung to blow out. In 1968, composers of this genre got a real scare when the same Canadian nose guild attempted to unionize all electronic synthesizers. They believed that these devices were sentient machines, and no more enjoyed making the sounds than most audiences did listening to them. 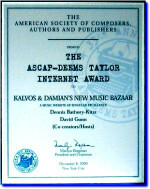 In a bizarrely worded manifesto that stretched the limits of grammatical good taste and subsequently did for the dependent clause what scabies did for calamine lotion, the guild demanded that any music written for electronic music synthesizers -- the analog ones, at any rate -- use only algorithms approved by the American Algebraic Association. This would have eliminated any models not divisible by prime numbers or that contained fewer than ten motif redundancies. Well, the electroacoustic composers community, not normally known for recognizing a problem, let alone championing any one cause, banded together and lobbied public opinion against the synthesizer alliance, and the guild was forced to retract its declaration. And once again, synthesized music was saved from a fate worse than ... well, than being fodder -- and, by extension, the bull's eye -- for the 189th episode of Kalvos & Damian's New Music Bazaar, which now will have to find another musical target for Kalvos to grind.